I apologize for the small unexpected break I took for the last week. Hopefully I can get back into the rhythm and stay there more consistently. But, that aside, this week will be another Comics week, starting with a book rave on Marjane Satrapi's graphic novel The Complete Persepolis. "Persepolis is the story of Satrapi's unforgettable childhood and coming of age within a large and loving family in Tehran during the Islamic Revolution; of the contradictions between private life and public life in a country plagued by political upheaval; of her high school years in Vienna facing the trials of adolescence far from her family; of her homecoming--both sweet and terrible; and, finally, of her self-imposed exile from her beloved homeland. It is the chronicle of a girlhood and adolescence at once outrageous and familiar, a young life entwined with the history of her country yet filled with the universal trials and joys of growing up." I am raving about this book on many accounts, but ultimately, I fell for this book because I felt it captured such immense growth in Marjane's life. The story begins at childhood and ends in adulthood, and in the course of 341 pages, I really felt like I could follow all the incremental changes that took place within her. I loved all the different chapters and sections within each chapter; they acted as nice dividers in long story. It made the book as a whole feel like a collection of all these separate memories that Marjane may not initially understood how they connected, but they do in the way they do with everyone. 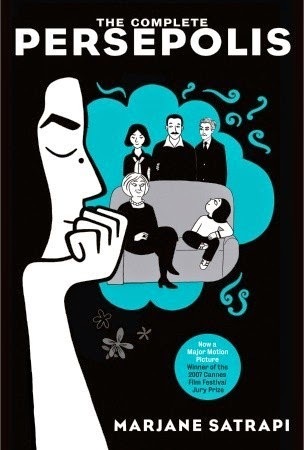 Marjane's graphic novel is the story of her life as a result of growing up during the Iranian Revolution. When I started this book, I quickly remembered just how bad I was in History class growing up. I was never great with dates, and having to just sit and listen for a straight hour was too much for me (lack of focus and short attention span). As to not feel entirely lost, I did a quick overview on the subject matter. That aside, I do feel that this book is completely readable if you don't know much on the Iranian Revolution. It is a major part of the book, but more in part because of how it morphs Marjane into the grown women she turned out to be. If you know absolutely nothing about the Iranian Revolution and you are interested in reading this book, I suggest you did what I did and just give yourself a brief Wikipedia overview. This graphic novel is done entirely in black and white, and the drawing themselves are fairly simplistic and almost childlike. When I started the book, I thought the style was perhaps too simplistic for my taste. (I mean, who doesn't like colors and shading?) But once I got into it, I almost forgot that the entire book was just black and white and found the childlike art rather charming. The author does such a great job with showing emotion with such simple art that served the story well. I would rate this book 4 out of 5 stars. It was an engaging story told through charming art. My only gripe for The Complete Persepolis is that, being an autobiography, I felt the graphic novel didn't let up to as much personal assessment as I would have wanted. Marjane just tells the readers what happened and her basic feelings of "anger," "sadness," etc., but you don't get much more than that. I feel as if that is part of the novel's style, but I just wanted more. Nonetheless, it's a small aspect that doesn't hurt it's overall appeal to me.